In response to new Federal and State requirements, operators of Underground Storage Tanks (UST’s) are now required to provide training to employees. Drew Fuel Services is proud to offer an online training and certificate program. All results are inputted into Drew Fuel Services proprietary software; iTankServices™. Is this required in the State of Florida? Not at this time. However, we encourage our customers to still comply. We are confident the State of FL will eventually follow the guidelines. We are a iTankServices™ customer, do we get a discount? Yes of course, as with all our iTankServices™ customers it is cost plus your negotiated rate. Call your Drew Fuel Services account representative for further details. 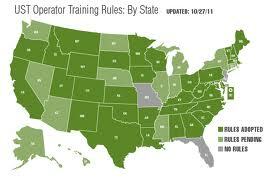 Who is a Class C Operator? An individual employed by or working for an organization with an UST who may respond to a spill or system alarm. .
How does the Drew Fuel Services online training program work? The average time to complete is about 45 minutes? This course is for anyone requiring certification as a Class C Operator of an underground storage tank (UST) system. The course includes an animated lesson, a short quiz and a handout. This course is approved or accepted in the following states: AL, AR, CO, DE, DC, GA, ID, IO, KY, LA, MD, ME, MN, MT, NH, NM, OH, OR, PA, SC, SD, TN, TX, UT, VA, VT, WA, WI, and WV. More states are pending. If you buy training for multiple users, each user must have a unique email address and user name.